George Wathen was Rye Cricket Club's man of the match in the victory away to Bells Yew Green. Rye consolidated top spot in Sussex Cricket League Division Four East with a fourth victory in as many completed matches. George Wathen’s 83 steered Rye to a four-wicket win in a high scoring contest away to Bells Yew Green on Saturday. Rye captain Harry Smeed lost the toss and was asked to bowl - a surprising decision as the wicket was soft. Rye got off to a good start, reducing Bells Yew Green to 32-2 with dangerous former Iden batsman Michael White back in the pavilion. Smeed (2-30) held an end up while picking up further wickets, and Jamie Fielding claimed three wickets and bowled well in difficult conditions. 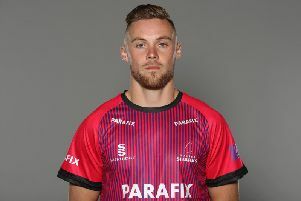 Wathen also bowled a very economical spell of 1-22 in nine overs. At 135-7, Rye seemed in control. But James Heath (70 not out) and Graham Piper (25) took the score along to 206-8. And when Bells Yew Green ended up with 233-9, Rye thought it was a par score given the size of the boundaries. Rye’s chase got off to the worst start with Tom Williams falling for nought, but Concepts of Rye man of the match Wathen and James Hamilton (49) put on more than 100 to put Rye in control. Smeed then smashed 40 in 24 balls to put Rye ahead of the required rate before Dan Seabrook (30) and Wathen took the score to 211-4, leaving Rye within touching distance of victory. Although Rye lost a few late wickets, they reached their target in 38.5 overs. Rye will host Buxted Park this coming Saturday in a first versus second encounter sponsored by My Sweet Old Etcetera. Play will start at 12.30pm. Standings (all played 5 matches): 1 RYE 126pts, 2 Buxted Park 111, 3 Rottingdean 101, 4 Mayfield II 93, 5 Bells Yew Green 92, 6 CROWHURST PARK 87, 7 Cuckfield II 80, 8 St Peters 75, 9 Glynde & Beddingham 55, 10 Hellingly 44.